Disney films such as, Snow White, Tangled, Cars and now, Frozen, continue to be very popular themes for murals in children’s bedrooms. 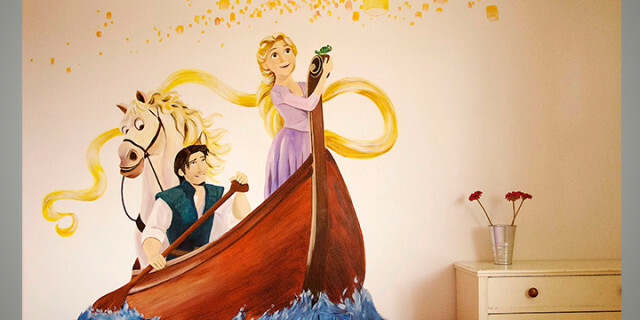 This hand painted mural of a scene from Tangled was designed to fit around the furniture in the bedroom. Murals can be anything from one figure to a scene that covers multiple walls in a room, and can be designed to fit both budget and setting. If your child has a favourite character or scene from a much loved book or film then this is a good option for a bedroom or playroom mural. This Disney Tangled mural was completed in three days.